HQ 510 RIP | SCREEN Graphic Solutions Co., Ltd. Choose your systemThe HQ-510 RIP is supported by a wide range of flexible options that can be used with the RIP to make a system that suits the work you do and the way you do it. Several options enhance the RIP's functionality, including specialized color management, screening, trapping, and TIFF/IT-P1 input and output. Post-RIP imposition and in-RIP OPI are also possible. Purchase only the options you need, when you need them. 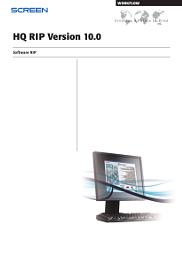 The HQ RIP uses the Harlequin(TM) ScriptWorks interpreter, which over the years has proven to be the fastest, most configurable RIP on the market. The HQ-510PC RIP is a high-performance PostScript-language-compatible raster image processor. It has a graphical user interface that is easy to use and it supports a wide variety of fonts and input formats. File formats include PostScript, TIFF, JFIF, and JPEG. The HQ-510 v6.0 RIP also supports Portable Document Format (PDF)1.4 or earlier files, without first converting them to PostScript. It supports PDF 1.4 features, such as transparency, JBIG2, 128-bit encryption, and referenced PDF. It supports PDF/X-1a and PDF/ X-3:2002, which permit a single file to be distributed to one or more locations as color-managed or CMYK data ready for final print. TrapPro and TrapProLite (options)TrapWorks, the previous in-RIP trapping solution, has been replaced by two new trapping options: TrapPro and TrapProLite. TrapProLite is a direct replacement for TrapWorks. If you previously purchased TrapWorks, your TrapWorks key can enable TrapProLite. Although your TrapWorks key can enable this software, TrapProLite has some new and improved features over TrapWorks. TrapPro is a new trapping engine that adds the features top printers and publishers demanded, providing an improved feature set over TrapWorks. Both TrapPro and TrapProLite are designed to trap jobs automatically. Both provide in-RIP trapping that can be easily set up to accommodate different types of jobs or customers. Trap settings can be saved to reduce system time, improving both quality and trapped output.